The weather has been grotty to say the least this week, and the first day of the Bournemouth Air Festival was a washout with bad weather and low cloud. We had originally planned to go on Friday which we thought was the best day weather wise, so we packed up in the morning and took our chances. At home the weather was grey, a little cloudy and there was some wind, so we took warm jumpers, extra blankets so we could stay warm if we needed to. We almost took an umbrella as well! I’m not sure what happened between leaving our home to getting to the beach but the weather had taken an amazing turn for the better. The sun was shining and the cloud coverage in the sky was low, so we were completely unprepared for the weather. We haven’t been to the air festival for two years and the last time we watched the air show from the beach was when Miss A was a couple of months old, so we wanted to return to the same area by the pier as we had really enjoyed it last time. In hindsight we didn’t sit in the right place to get good pictures this year as we found ourselves behind the new zip wire by the pier so the planes seemed to focus more along the stretch of beach between the two piers rather than over the pier. Despite not having great photos, we did have a great afternoon, and enjoyed the sunshine. I suspect it was them yes. They were great as always to watch. What a fab day! You were so lucky with the weather and what a great way to watch an air show from the beach. 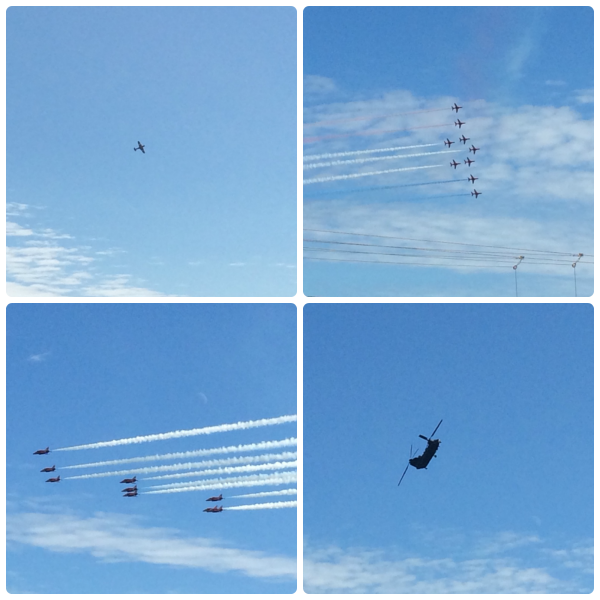 The red arrows look amazing, I really want to see them again. We decided to give the air show a miss this year altogether. We have been the last 6 years and to be honest the kids were a little over it last year. Looks like you guys had great fun! The weather has been crazy this summer! we didn’t go last year at all, and wanted to go back to the pier this year. Sounds like a great afternoon and you were really lucky with the weather! we got around the restricted view as it were. It was a great afternoon. It is always hard to predict the weather! Glad it is nice for you!